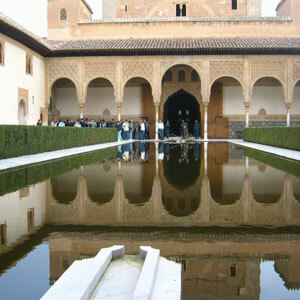 - Visit the Alhambra in the Afternoon with all the comforts, do not worry about anything. - Without lines and without waiting, Alhambra tickets are included. - Enjoy the pick-up from your hotel and your official tourist guide. Choose between Morning or Afternoon. Visit the Alhambra in the afternoon with us and fall in love with the beauty and marvels of this spectacular Islamic monument. Also do not worry about how to buy Alhambra tickets, since our visit includes admission and explanations by an official tourist guide. On this tour around the jewel of Granada, you will visit all the main areas of the monument open to the public, and we assure you that each one will be even more impressive than the last: the Alcazaba, an ancient fortress, the Nasrid Palaces, where the famous Court of the Lions is, the Palace of Charles V and the wonderful gardens of the Generalife. Pick up at your hotel. If you do not stay in a hotel in Granada city-centre the meeting point will be in our Welcome Visitor Centre ( located at the Yedra Real, in front of the Alhambra Parking nº 1) . Including: official guide (in English), entrance tickets to the Alhambra and transport with guide to and from your hotel (within a radius of 5 km from city-centre). The time of the afternoon visit varies depending of the day, it may be between 1:00pm and 5:00pm, so to confirm the exact time, please call us the day before your excursion between 11:00am and 1:00pm or between 5:00pm and 7:00pm at at (+34) 958 535 872 (+34) 958 535 872 ó (+34) 682 086 011 (+34) 682 086 011 - Reservations Centre. End of the tour: we will finish our visit at the same point of the meeting. (1) Pick up and drop off by bus from your hotel in Granada city center to the monument. 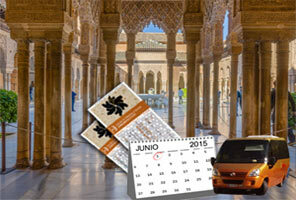 (2) Tickets for the monument, for your access to the Nasrid Palaces, the Generalife and the Alcazaba. (3) Accompaniment by an official tourist guide of Granada who will help you to discover the history that covers every area of the monument. - Occasionally, the tour can be made simultaneously in two languages. Tour is confirmed in SPANISH and ENGLISH, any other languages will depend on a minimun of 8 people. - Due to the length of the walk we recommend you wear comfortable shoes, and bring plenty of sun protection. - The order of the excursion may be modified by instructions of the Patronato. - Occasionally, for operational reasons, the excursion can be done simultaneously in two languages. - You must keep your entrance ticket to the monument with you during the entire tour. - If you want to modify or cancel your reservation, please contact us via the customer form. After completing the purchase process your booking will be automatically confirmed. You can pay with your credit card (VISA and MasterCard) or bank transfer. You will receive a confirmation of booking email and the voucher for your visit once you have completed the payment. This voucher must be printed and showed to our tourist guide before the beginning of the excursion to receive your tickets.